You might have noticed I haven’t posted an Instant Pot recipe for a while. I was in Georgia, visiting over the holidays, and no Instant Pot. Honestly, I went through withdrawal! But when I got back, and met a friend at Panera, I knew exactly what I wanted to make next! A 30 Minute Total Time Instant Pot Roast. So I could copycat those famous Panera Steak & White Cheddar Panini. Or so I could make a few other things! This was the same friend I cooked with when we made the Roasted Sweet Potato and Brussels Sprouts and the Broccoli, Ham & Cheese Quiche. The best thing we did that day was recreated Panera’s Steak & White Cheddar Panini. And then later in the week, I made French Dips (a childhood fave! Recipe is below) and they were pretty awesome, too. Rump was on sale, two for one, so it was an obvious no-brainer. The Rump usually isn’t my first choice in a roast. It’s a little dense, it’s lean and if it’s not perfectly cooked and on the rare side, it can be dry, tough & chewy. On the plus side: the price was great and cooked right, it can be fantastic. And as you can see, the Instant Pot cooks up 30 Minute Total Time Instant Pot Roast just right. I keep emphasizing the 30-minute total time because the Instant Pot needs to heat up and get to pressure and then when it’s finished cooking, it takes more time to cool down. So a lot of recipes use the actual “cook time” as the amount of time a recipe takes, which can be really deceiving. My recipe takes into account the heat up, cook time and cool down time all in that 30 minutes. It’s a little miracle! Braise it, like this Slow Cooker Barbacoa, in a slow or pressure cooker or in the oven until it is literally falling apart. Sear it, roast it (or in this case, pressure cook it) until it’s just medium rare. Sharpen up those knives and slice it thinly against the grain. As you can see, The Instant Pot came to the rescue, turning out a gorgeous, medium rare roast. In minutes. With a flavorful, onion-y au jus and caramelized onions to lay on top of the French Dips. I was very happy with the way my Instant Pot turned that cheap cut into something gorgeous: my Instant Pot Roast Beef. There is no peeking with the Instant Pot, so it helps to have a little flexibility in your expectations. There’s a range of doneness, but if rare isn’t your thing, slice and immerse those slices in the au jus to gently cook a minute or two longer in the residual heat. That will keep it tender. When pressure cooking, the timing isn’t just about weight, it’s also about shape. Thicker roasts will be less rare than smaller ones, in the same amount of time. It’s really counter-intuitive. This timing and method for Instant Pot Roast will work for a wide range of roasts, though I haven’t made one that was over about 4 1/2″ inches thick. Since these roasts were about 6 pounds, I divided the one I used in two. You’ll generally want to count on about 6 ounces per person, and a little less when refashioning into something like sandwiches. Two & half pounds = 40 ounces. Divided by 6 ounces per person, it’s 6 1/2 servings. That’s enough for a meal and a few leftovers. And leftovers lets you “cost average” the price of this beef over two meals. I apologize that I call this a 30 minute roast, because I realized after the post was all done and set that you need a few additional minutes to saute & bring up to pressure. So it’s more like a 38 minute roast! Rub roast with Montreal Steak seasoning, as little or as much as you’d like. Add oil to Instant Pot and turn to Saute, High. When hot, add roast and brown on all sides. Remove roast, add broth and scrape any bits off the bottom. Add onions in a pile, do not stir. Add the roast on top, centering it in the middle, right on top of the onions. Cancel out the Saute function, add lid, seal and turn Instant Pot on to High Pressure, using the Manual function, for 4 minutes. Do not choose (or else cancel out) the Keep Warm function. Rest for several minutes and carve. If the roast is rarer than you’d like, add the slices back into the hot au jus to gently cook to the desired doneness. Turn the instant pot back on to Saute and choose Low if the au jus needs to be heated. Serve with au jus. If more au jus is desired, add the remainder of the broth from the can. Note: I love scratch cooking but there’s no shame in adding what’s needed to get an intense flavor for the au jus. I like to add a little Johnny’s French Dip au Jus. Just a touch, by taste. Any remainder can be divided into ice-cube trays and frozen for the next roast. If more au jus is desired, add extra broth to the onions and sauce in the instant pot. 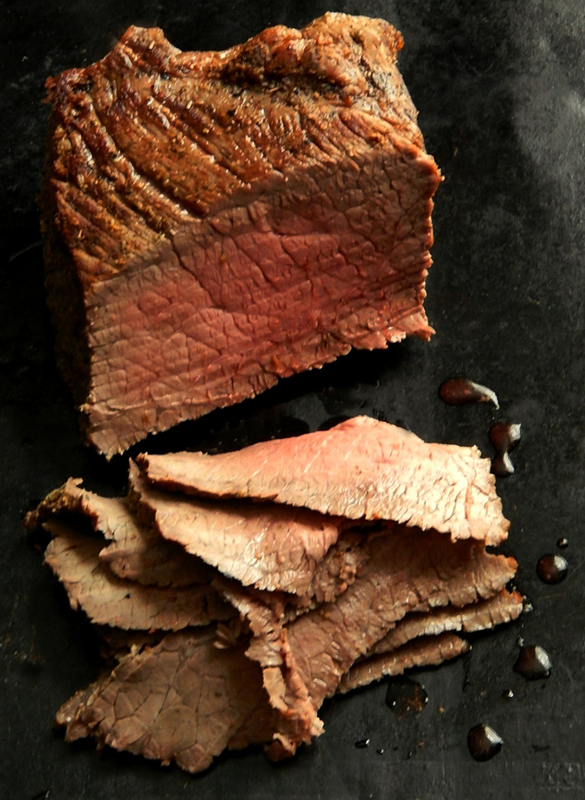 Dip roast beef into warm au jus in Instant Pot. If you’d like your Roast Beef cooked a little more, leave in the au jus until the desired doneness. Lay on sliced French Baguette. Add cheese on top of hot beef if desired. Add onions from the au jus on top of the beef. Divide au jus among 4 bowls and serve with sandwiches. This entry was posted in Click here for Bargain Meals, Click here for Fabulous Food Posts and tagged au jus, Beef, Beef Stock, Canned Soup, Instant Pot, Johnnys French Dip Au Jus, Montreal Steak Seasoning, roast beef, rump roast. Bookmark the permalink. I made the rump roast in my IP last night and it turned out perfect! It was the first thing I have ever made in an IP and it was a beautiful medium rare! Hi Casey! Yea for you!!! I’m so glad to hear it, too, and thanks so much for stopping by to comment! Another person said she had some difficulty and I wasn’t getting any feedback from her to troubleshoot! So now I know it’s not just me that had good results!! I’m glad you enjoyed it, and hope you love your IP as much as I do. It’s been a gamechanger for me and this from someone who has used a stove top pressure cooker for years! Do you do a quick release after the 4 minutes or a natural release during the 20 minute wait? Hi Marita. Cook 4 minutes. Cancel out or do not choose (depending on model) the keep warm function. Set a timer for 20 minutes after the 4 minutes is up. If any remaining pressure (there never has been for me which is why I didn’t say to do a release) do a quick release after the 20 minutes. Remove immediately after the 20 minutes. I can alter that wording in the recipe if it will make it clearer. So I tried this recipe, different seasoning, seared all sides till they were nicely browned and followed all the steps. It sadly came out raw in the center! Any tips because I want to have a instapot roast recipe that doesn’t cook it all the way through. Ok, I’m a little surprised. Was the roast about the same size? It sounds like it just needed to be cooked a bit longer. How raw was it? Like red raw all the way through or just too “rare” – just asking because I’m trying to figure it out. But in general, when i do things in the instant pot, I have a little notebook and jot down particulars just because any deviation can produce a different result, and of course, no peeking, so you never know until you open that thing, right! It seems super easy to cook a roast to shreds, but a little more particular and precise to get it to a nice rare. So are you supposed to just let it sit in the pot not on anything for 20 minutes after the first 4 minutes or are you supposed to turn it back to manual for 20 minutes? Hi The first is correct. Cook for 4 minutes then make sure it is off for the next 20. After 20 minutes release any remaining pressure! Hope that helps. I think I answered you on FB, too, just a few minutes ago. Ok, so need to give this a try soon! Busted out my Instant Pot the past few weekends and trying to make it a point to use it at least once a week! I’d love for you to come share at Let’s Party https://themarkandjanshow.com/2018/01/31/lets-party-6/ … we look forward to seeing you there! Thanks Jasmine! I hope you guys love it! I can see that I will have to take my Instant Pot out of the garage, evidence is mounting! Thanks, Liz! I have been meaning to use it for my good oatmeal. Of course you posted those wonderful oats a couple weeks ago! That is really the best oatmeal I have ever had, but pay attention to the type (steel cut) and it is best if half the liquid is oat milk or whole milk or half and half (!). And, the freeze dried fruit is delicious, also cut up apples. Other fruit turns into a mushy mess. Good hints! Thanks! Where do you get your freeze dried fruit? I wonder what the science for a larger roast cooking more well done than a smaller? More pressure for the space? Inquiring minds… Looks tasty though! I do love me a good French Dip sammie! I read all about it once, but for the life of me, I can never remember why! I love French Dips. When I was growing up they were pretty much a staple at every restaurant and it was my go to when we ate out.